I’m sorry about the frankly huge gap in posts. I have exams coming up so my life is one giant whirlwind of balancing revision with everything else. I will try and do better, but until June 25th I expect posts will be a bit thin on the ground. 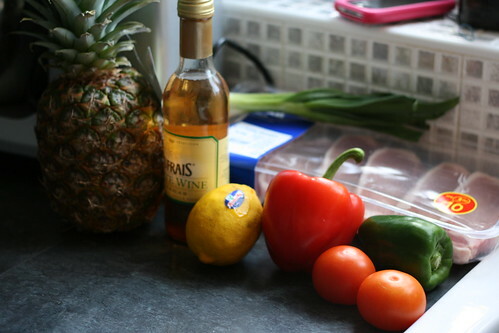 That being said, to make up for my quietness I am going to share this utterly gorgeous recipe for sweet and sour pork. I found it off the Slimming World website and, in a word, nom. I edited it a bit and will share my edited version, but I encourage you to make it. It’s delicious. Start by preparing all the vegetables. The peppers need to be deseeded and diced, the tomatoes need to be chopped, the spring onions need to be chopped. Then season your pork. 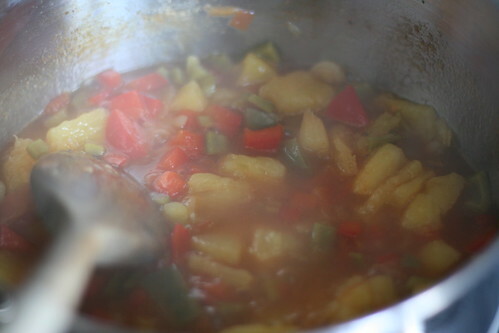 Remove all the fat and mix the cumin, coriander and turmeric together. 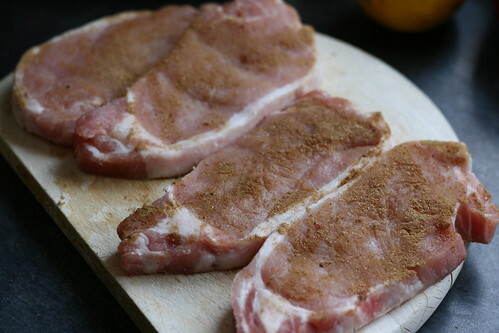 Then “dip” the pork chops in the spices so that they are covered on both sides. Mine weren’t particularly evenly covered — just use a clean finger to spread the spices over if you’re worried. Then cook the pork chops. You could roast or grill them, but I cooked them on my George Foreman grill (I love my George Foreman grill. It’s my genuine favourite way to cook anything). If you’re roasting them, spray a roasting tin with Fry Light and roast at 180°C for about 15 minutes. When cooked, set aside. Whilst they’re cooking, make the sauce. 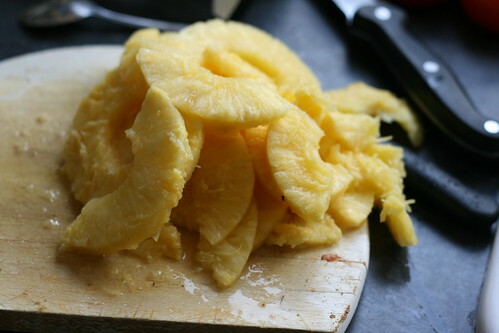 If you used a can of pineapple, cut the rings into chunks. 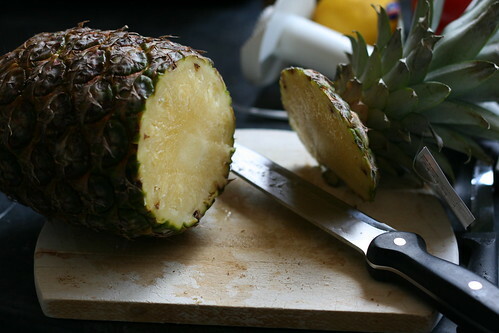 If you’re using a pineapple, you need to get the inside into chunks too. We have one of those gadgets where you cut the top of the pineapple off and stick it in, twist it and get perfect pineapple rings. If you don’t, just carefully cut the sides of the pineapple off and cut into chunks. It’s up to you whether you add the hard centre ring — I wouldn’t, but that’s just because it hurts my teeth! 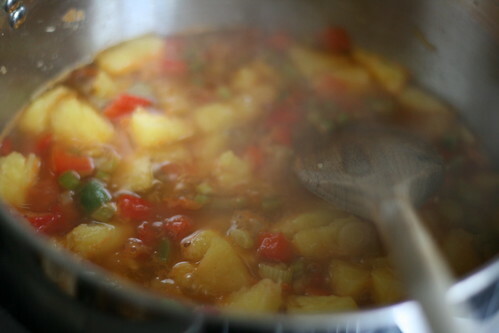 Put the tomatoes, peppers, pineapple chunks and spring onions in a small pan with the white wine vinegar and four tablespoons of water. Sprinkle in about a level teaspoon of chilli powder. Then cut the lemon in half and squeeze the juice into the pan, being careful not to get the pips in (either juice it properly or squeeze it over a sieve). Then heat gently over a low heat. 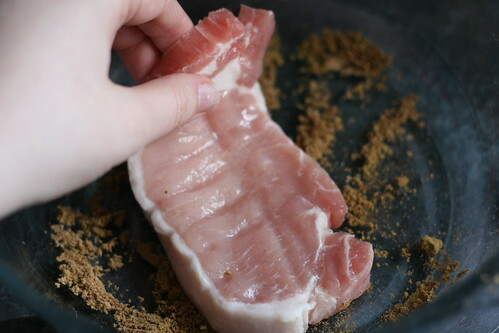 Then simply slice the cooked pork and stir this into the sauce. 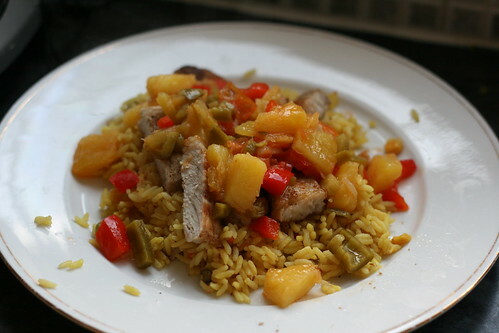 I then piled rice onto a plate and poured the sweet and sour pork over the top. Yummy. The only complaint from my family was that there wasn’t enough — I think that’s partially because we’re all gutsy pigs and partially because it was so utterly lush. I’ve also made this with chicken breast rather than pork chops, and it works just as well. There’s a few more photos here and let me know if you try it. I hope you do — it’s a really scrummy recipe.